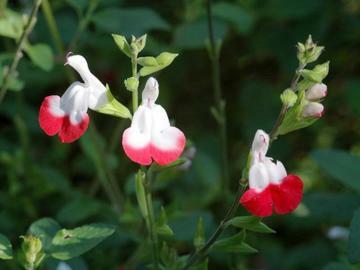 Striking bicolour flowers of vivid red and white, produced over a long period from summer into autumn. In hot conditions the flowers are sometimes all red or all white. Small bushy shrub with smallish, opposite, oval to elliptic, pale to mid-green leaves. Warm, dryish position with well drained soil and full sun. Found near the Chiapas area of Mexico, introduced by Richard Turner of the Strybing Arboretum, San Francisco.